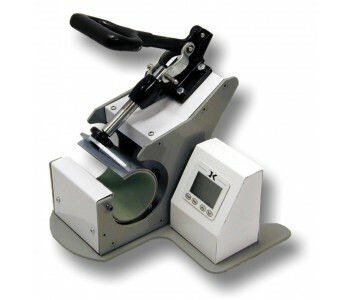 The DK3 Digital Mug Press is the latest addition to the Digital Knight line of presses. This press is a full wrap-around , handle to handle, top to bottom printing mug press. It can press images up to 5 inch high, depending on the mug size. The DK3 is fully adjustable, accomodating all mugs available on the market. This includes 11 oz, 15 oz, 16 oz mugs and steins. The ability of the press to open extra wide allows for easy loading and unloading of mugs from the press. The thick solid steel framework and die-cast clamp assembly provides a heavy duty framework for non-stop use. The clamp assembly can be adjusted for very heavy pressure, allowing for full bleed transfers on even the most demanding mugs. Finally - a mug press that compensates for less than perfectly straight mugs! As with all our Digital Knight presses, the DK3 utilizes a state of the art digital control system with an unprecedented 3 year warranty on the heat control electronics. With digital temperature, time and programmable presets, cycle timer, and many other features, the consistency and productivity of mug printing is maximized. At the heart of the DK3 is the SuperCoil-Microwinding™ heater technology, a system of embedded heater windings that wind tightly and closely together throughout the entire platen for extremely even heat, fast recovery and fast heat up times. The DK3 will start up in only a few minutes, and unlike other presses runs constantly at the set temperature, instead of a much lower idle temperature. The DK3 comes with a 3-Year / 3000 cycle warranty. Other mug presses use silicone blankets with short lifespans. The DK3 uses a patented stainless steel mug band heater technology that has proven to be far more reliable in the field than traditional methods. Softer heater liner for accomodationg inconsistent mugs. 3 year / 3,000 cycle warranty on heat platen. 3 year warranty on control.